When a certain load current goes through cable triple aluminio, it will get heat. With the increasing of load current, the surface temperature of cable de aluminio triplex will increase. If it can’t be handled, it will course some damages. For example, the core temperature of cable triplex aluminio with PVC is limited on 70℃, and the surface temperature will be lower than it. So it will be safe if the surface temperature of cable de aluminio triplex is underneath 60℃. From the angle of protecting power supply, it will good in lower temperature. Huadong adhere to produce the qualified products. If you send the inquiry, you will get the cable you want. There are some reasons to cause hot phenomenon. The first is the conductor resistance of cable triplex aluminio is unqualified, and it contribute to the hot phenomenon of the cable de aluminio triplex in the running. Second is that the wrong choice. The conductor cross-section of cable triplex aluminio is too small. After long-time operation, the unbalance of heat generation and heat radiation will course heat phenomenon. The third is too narrow of installing cable de aluminio triplex, the effect of ventilation and heat dissipation will be effect. Or the cable triplex aluminio is too close to the power supply. The heat can not be dissipated. They will influence the effect of heat dissipation, and it also may curse the heat phenomenon. The forth is the producing technology is not so good, and the pressure isn’t good. The resistance will too big, and contribute to the hot phenomenon of cable triplex aluminio. 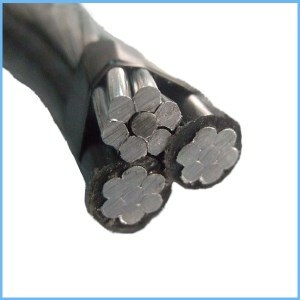 The fifth is the insulated performance of cable de aluminio triplex is not good. The resistance is too small, and it will to course the heat phenomenon in the operation of cable triplex aluminio. From these reason, we can know high-quality and required cable de aluminio triplex is the most important. Huadong has 30 years of producing experience and 15 years export experience, so we can provide you the best case.